Expansion Springs these are used in conjunction with stainless steel banding and stainless steel wing seals also referred to as breather springs or chil springs. By affixing to the banding they allow the banding to expand and contract where required. These are widely used over metal jacketing for oil and gas pipework. We can also supply compression springs also often referred to as mighty springs or mity springs commonly used for large diameter pipework, tanks and vessels. Expansion springs are designed for 19mm (3/4") banding simply attached to banding/­strapping with stainless steel wing seals. The banding is slipped through the seal and then through the spaced opening at either end of the spring. 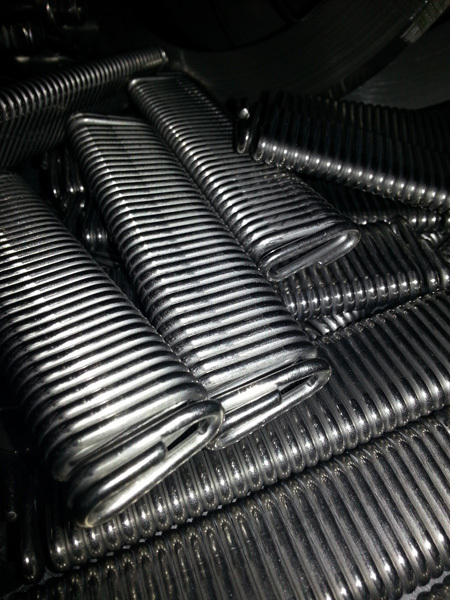 Heavier duty springs can be supplied for 2" or 3" wide banding. Can be supplied in grades 302, 304 and 316 stainless steel. Standard sizes available are 4" (100mm) long but also available are other sizes on request 2" (50mm) and 4/3/4" (120mm). These replaced expand R bands which are no longer in production as these offered a better solution.